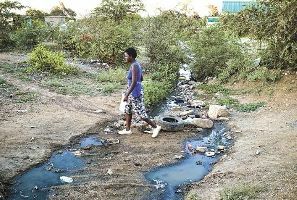 A health time bomb is ticking in Harare’s Mabvuku suburb as raw effluent has been flowing from the sewer system for more than three weeks without any corrective measures being taken. The putrid stench that greets any visitor to the residential suburb of Mabvuku is the first telltale sign that all is not well in the area. Raw effluent is flowing from the sewer system, causing a health scare for concerned residents who have endured the smell and generally unhygienic conditions for a period which could not be ascertained as some said the overflow began three weeks back while others said it started two months ago. With the rainy season in full swing, the sewage has become a fertile breeding ground for water borne diseases and malaria causing mosquitoes in nearby swamps, prompting urgent remedial action. An obsolete sewer reticulation system and an ever growing urban population pose a major challenge for the city of Harare in its efforts to satisfy the standards of proper sanitation.